Stop chalking up! | | Swing Big! Today I am going to talk about something that I see in gyms A LOT. This is gymnasts jumping up on the bar, performing one or two skills (alright, maybe like 3 or 4) and coming down and chalking up again. Granted I understand that this is necessary sometimes, when learning new releases etc. But in general I really think that if athletes are only doing 3-4 skills in a turn then they only need to be chalking up every three to four turns. Some gyms have rules about this (ex: do around 15 skills before chalking up again). If your gym doesn’t have something like this, I would highly advise it. This first video is from level 10 nationals. If I counted correctly this routine has 14 skills in it. In order to be able to do to this kind of routine gymnasts need to be USED to doing 14 skills in a row and not feeling like they’re slipping off the bar or too weak to continue. This second video is of the elite compulsory bar routine. This routine also has about 14 skills. It’s long, it takes strength, stamina, precision and requires a decent variety of skills. If you are looking for a “core” stamina routine for your 9s and 10s, especially in the off season this is a good place to look. Those first two circles on low bar I believe are changeable (stalders, clearhips etc). The big thing is whatever you are doing your kids need to be able to do more than 3 or 4 skills without chalking up. True fact…..there is a wide genetic variation in sweatiness of hands/feet. As a former gymnast with sweaty hands/feet, I can say that a quick dusting of chalk before grabbing the bar greatly helps this. Number of skills in a routine, something to consider. Time duration between chalk ups, also something to consider, as several turns greatly surpasses the time duration of a bar routine. 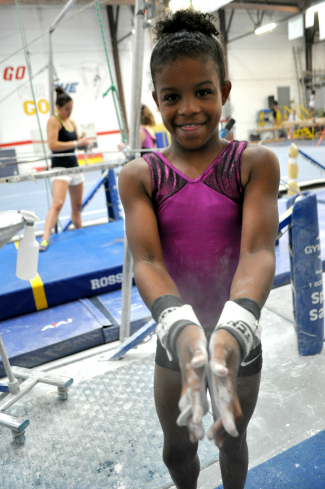 Looking at sweating as a volume of water excreted over time, especially during warmer months, can mean that if a sweaty gymnast is in a rotation with several others, waiting three to four turns or 15 skills between chalk ups might result in a slippery situation.